Pockets of pudding and fresh berries make this easy White Chocolate Berry Pudding Cake a delicious and sweet treat. It’s the perfect dessert for a picnic or party on a hot summer day! *Make sure you don’t miss any recipes. 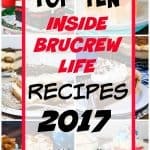 Sign up for the free BruCrew email to have the recipes sent to your inbox. It’s hard to believe that I have been blogging for over 8 years now. Some days it feels like I just started, and then other days it feels like it’s been forever. 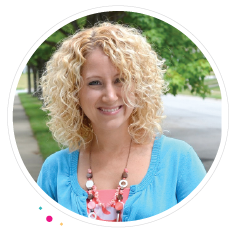 I have seen so many different changes in how things are done in blog land over the years. I get two questions about blogging all the time. Do you still enjoy writing stories and how do you keep coming up with new recipes? The answer to those is yes, and I can’t stop thinking of new things to make. Every time I get a new idea for a recipe I put it into my notes on my phone or on a sheet of paper on my desk. At the moment, I could probably blog for another 10 years based on all the notes I have stashed everywhere. My brain just can’t stop thinking of fun new desserts and dinners. Most times they are totally new and original, and some times they are just a fun twist on a classic. 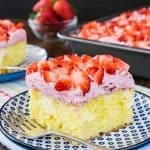 A few weeks ago I made this easy lemon strawberry poke cake and shared a video on Facebook. I had no idea that it was going to go so crazy over there. You guys really love your lemon and strawberry desserts. Although, there were quite a few people who said they would like to see a blueberry version. Of course, that got the dessert wheels rolling on how I could change up the cake to incorporate the blueberries. I realized that I have quite a few boxes of pudding just sitting in our pantry waiting for inspiration. So I decided on a white chocolate pudding mix and a vanilla cake mix. Blueberry pie filling and fresh blueberries on top were my first choice. Until I got to the store and found a few cans of mixed berry pie filling. All of a sudden I decided to change up the topping, so I could use a bunch of different berries on top. 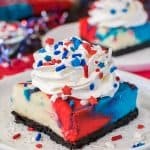 By using red and blue berries it totally made this cake perfect for all those 4th of July picnics that you will be attending next month. 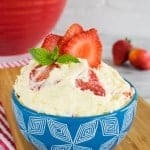 This strawberry cheesecake poke cake is another fun red, white, and blue dessert that you might like for picnics. 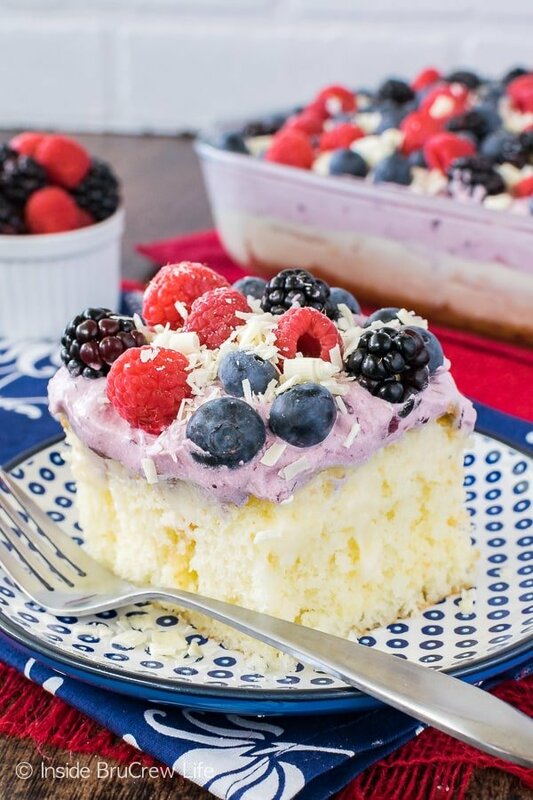 Let’s talk about how easy it is to make this white chocolate berry pudding cake. First make your cake mix just like the box directions say. Let it cool about 5 minutes after you pull it out of the oven. Use the handle of a wooden spoon to poke holes all over the top of the hot cake. That’s exactly how this fun cake got it’s name. Whisk together the pudding and milk and let it set for about 2 minutes in the fridge. Then pour it slowly over the top of the cake. You will need to use the back of a spoon to push the pudding down into the holes. Chill it in the fridge for a few hours. 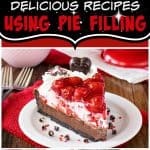 Gently stir together an entire container of Cool Whip and a can of pie filling. It makes the easiest and fluffiest frosting for this type of cake. Spread it on top. Sprinkle the fresh berries on top. Feel free to use more or less berries. I left a few spaces in the topping because I wanted to add white chocolate curls too. Use a veggie peeler to gently create little curls and flakes from a white chocolate baking bar. Sprinkle those on top right before serving. Boom! Easy peasy dessert with just a few ingredients. 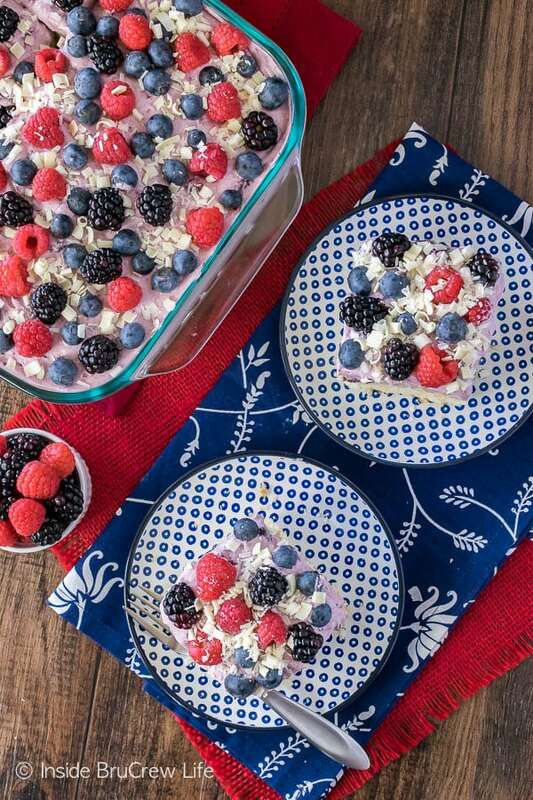 Gotta love a fresh summer dessert loaded with lots of berry goodness! 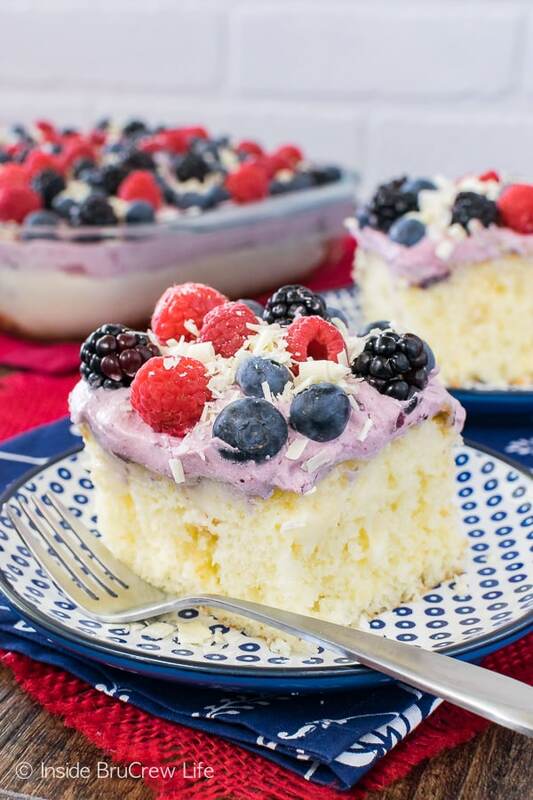 Pockets of pudding and fresh berries make this easy White Chocolate Berry Pudding Cake a delicious and sweet dessert. Perfect for hot summer days! Make and bake the cake mix according to the package directions. Remove from the oven and cool on a wire rack for 5 minutes. Use the handle of a wooden spoon to poke holes all over the warm cake. Whisk together the pudding mix and milk. Refrigerate 2-3 minutes or until slightly set. Pour over the top of the cake and use a spatula to push the pudding into the holes. Let cool another 10 minutes, then refrigerate until completely chilled. Stir together the Cool Whip and pie filling gently. Spread on top of the chilled cake. Add the berries to the top of the cake and refrigerate until ready to serve. Use a veggie peeler to shave the chocolate bar into small curls and pieces. Sprinkle on the cake right before serving. 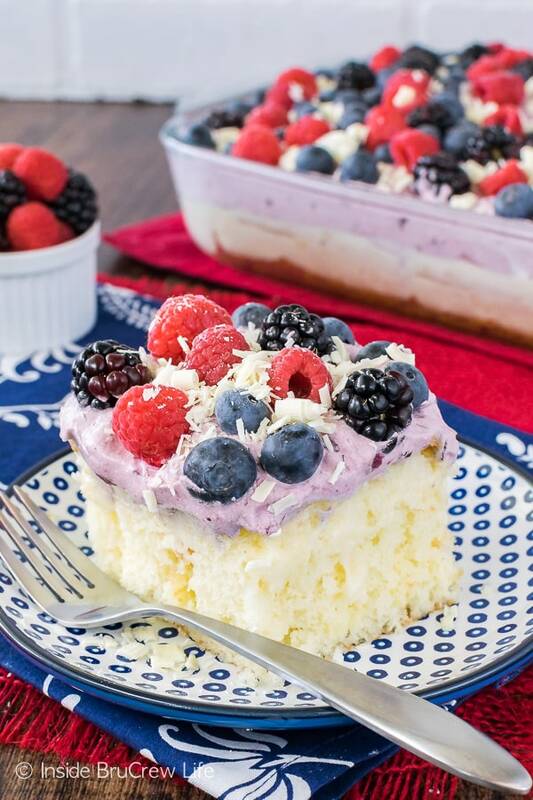 Still looking for more recipes that are loaded with berries? I am in love with this Berry Pretzel Dessert. Sweet and salty desserts are always a hit with me! 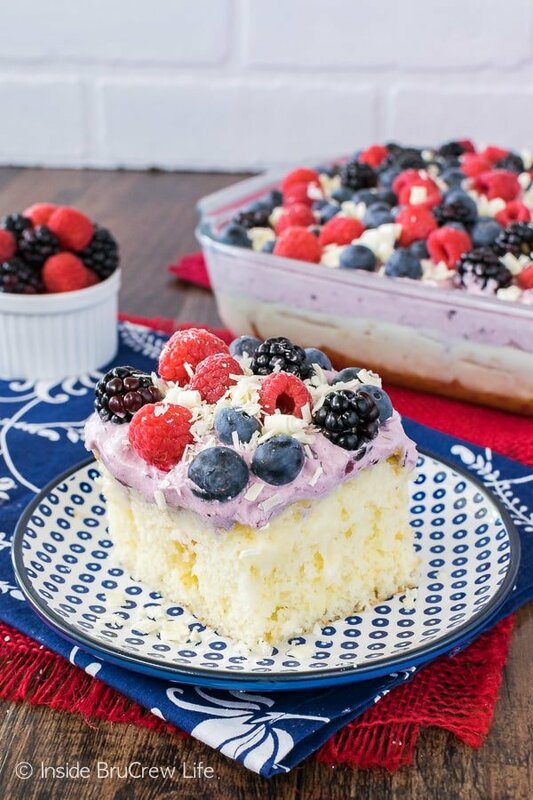 I also have a thing for layered desserts, so this Triple Berry Tiramisu and this Double Berry Cheesecake Lush are on my must make list this summer!!! Look at all those berries!!! 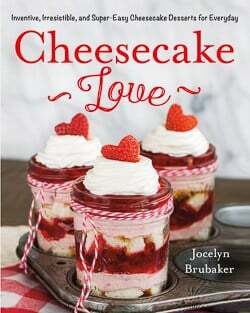 The TEXTURE on that cake, Jocelyn! It looks like the perfect summer delight. Girl, you know it! 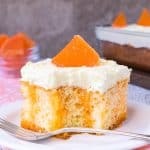 The creamy pudding and fresh fruit were the perfect addition to a soft cake!